Day 3 – Trois Pistoles | Turning my world upside down! I am writing after a full but relaxing day. I don’t think we drove more than 200 km, but we managed to fill the day. We left St. Jean Port Joli after breakfast. We drove to Riviere du Loup by way of Kamouraska. 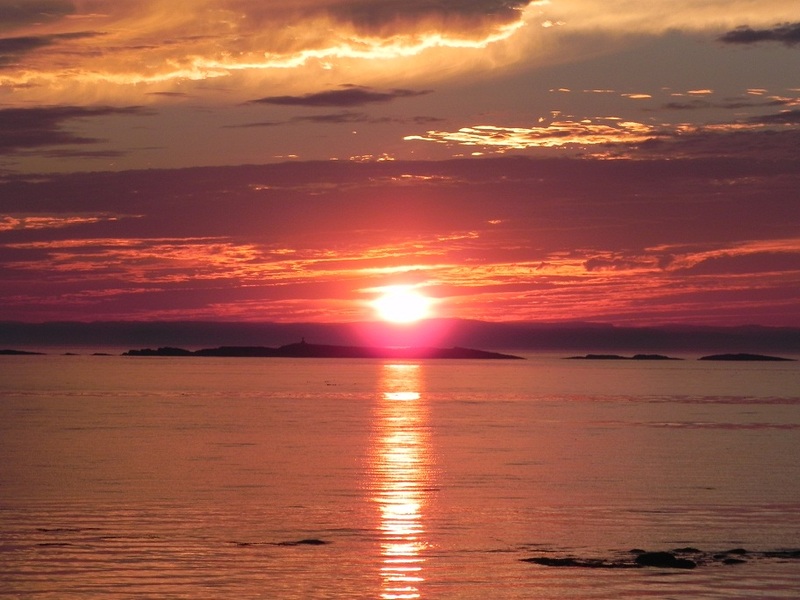 Kamouraska is the subject of a novel I read back in high school. It was all about the hardships of the early settlers in this region, basically about the miseries of winter (and looking it up, I find that my recollection of the novel has nothing to do with the book at all). But I remembered the romantic name and was glad to finally visit. Many of the small towns in this area are artist colonies and this one is no different. The bakery caught our eye, so we stopped there first for a loaf of bread and a croissant each. 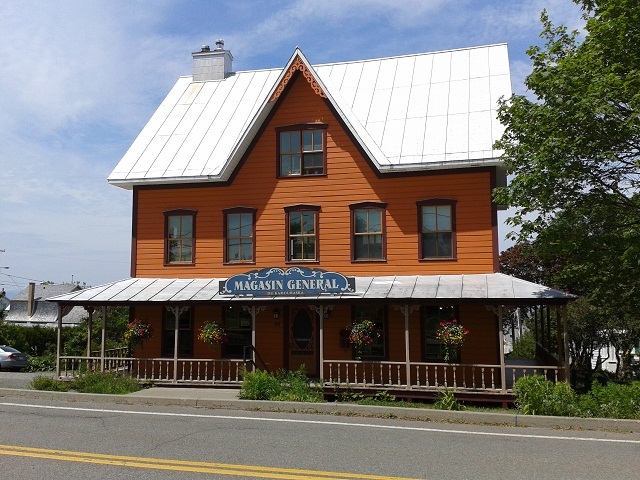 We ate and walked, visiting the general store and the local church, St. Joseph de Kamouraska, another story of destruction by fire and reconstruction. A nice young man gave us a quick tour as I asked questions about the Stations of the Cross and the wonderful stained-glass windows. Leon looked around at all the saints but couldn’t find St. Barbara, the patron saint of the Artillery. I don’t think she is a Catholic saint, so I doubt we will find a statue of her in a church around here. 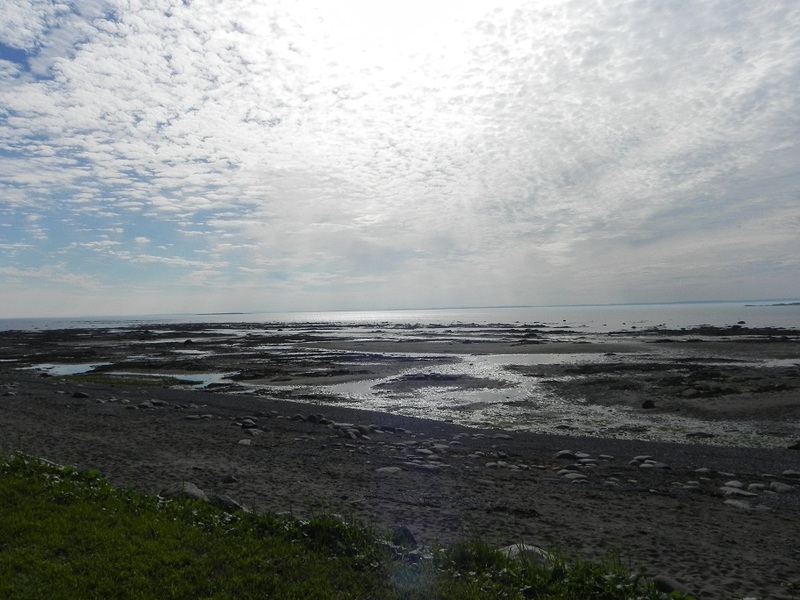 On we drove to Rivière du Loup, which was named after either the seals (loups-marins) or a ship called Le Loup which was stranded at the river’s mouth. We’ll never know. 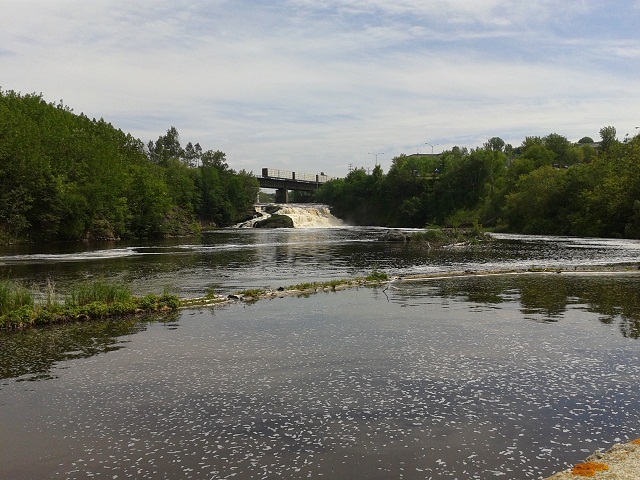 We did our grocery shopping, some quick banking and stopped for lunch at a park where falls generate electricity. Lunch consisted of small local shrimp (crevettes de Matane) with mayo and lettuce on fresh bread. Yum!! We were parked beside a van that had a sign on it about an escargot world tour. Of course, we had to ask the people what that was about. They told us they were from Brittany, travelling the world in their camper over the next several years. Their current trip was to take them across North America, up to Alaska and down along the west coast to South America. Total travelling time – 3 years! Sounds like fun. We exchanged ideas on where to visit along the St. Lawrence south shore and where to camp for free and then we were off. Big shout outs to Nadine and Jean Paul! Our current campground is right on the sea. Yes!!! The river is no longer called that here. We are now on the banks of the Gulf of St. Lawrence, where the water is salty and the whales come to visit in the summer. No whale sightings yet, but what a fantastic sunset! That is a gorgeous sunset! I went whale watching years ago in Quebec – hope you get to see some too! Didn’t see any whales yet, but we just saw a seal on a rock as we drove into Matane. Me again…And now to hopefully get ahead of you a bit�.!!! � SOME SUGGESTIONS: � Perce: The tourist spot. �le Bonaventure 293 different species of birds have been recorded as visiting, migrating to, or living on Bonaventure island. The most common bird found on the island is the Northern Gannet. The island is home to one of the largest colonies of gannets in the world, with 47,800 pairs in 2011. There are boat tours around the Ile�.if time and you interest prevail. � New Carlisle, Quebec is a small town in the Gasp� region of Quebec, Canada, best known as the boyhood home of Ren� L�vesque; although he was born at Campbellton, New Brunswick. The population is approximately 1430, half English-speaking and half French-speaking. But you must at least stop and take a picture beside �little � Rene�s statue. � Bonaventure: The first permanent European settlement of Bonaventure was in 1760 by Acadian refugees who had successfully avoided the expulsion of Acadians that had begun in 1755. Some of these early settlers were present at the Battle of Restigouche in July 1760, where a mixed force of French navy aided by Acadians were defeated by the Royal Navy. Many of today’s Bonaventure residents are of Acadian descent. Prior to permanent settlement, the Bonaventure harbour had often been visited by Europeans and was the location of temporary camps and posts for many years before. At the time of settlement, Bonaventure was located in lands possessed by France, but in 1763, after the Treaty of Paris, all of New France was ceded to Britain, and Bonaventure became part of British colony of the Province of Quebec. Later, some of the lands already settled by the Acadians were granted to anglophones, although after decades of petitioning the Queb�c government, some of the Acadian settlers were able to gain title to the lands they occupied. However, even as late as 1891, more than half of the homesteaders in this region had no legal title to the lands they lived on. Thanks for all the info, Brian. We are loving the slow trip up here so far. Just realized that I should have been responding “above the line”…so here it is again….hope this isn’t cluttering or confusing. Looks like you’re going to have some decent weather for the drive along the north coast of the Gaspe….that is a bonus.Only in July…It gets somewhat more rugged after St. Anne de Mont. When you approach The town of Gaspe I would suggest seeing Parc Forillion…One of the biggest light houses in Canada there. Both sides of the peninsula are beautiful…very rugged with some great walking trails whales watching should be good. 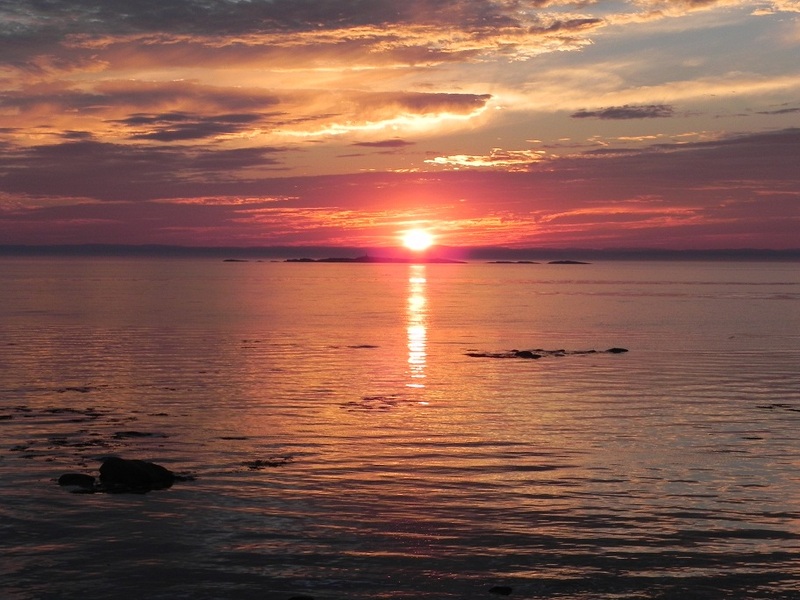 The town of Gaspe isn’t that interesting…..on to Perce… .You’re making me envious…. Give me some little indication that these are reaching you. You’re making me envious….